久しぶりですね！I haven’t written in a while, huh? I’ll be posting lots of stuff soon, so keep an eye out! However, I like to think that while my English may be suffering, my Japanese is getting better! I’ve had lots of opportunities to speak with Japanese students on campus as well as random people in the area I live in, and while I still stutter, the responses and comprehension are coming faster. A few weeks ago I talked with two Japanese students who thought I was close to being completely fluent; today I met two more who said the same thing! I have no qualms in admitting I am nowhere NEAR being that good, but it was still nice to hear. This is Yuna; we met last week at Language Cafe! One of the most rewarding things I’ve been doing recently has been the Language Café. Every Thursday, a bunch of Japanese students and a handful of international students get together to talk, make new friends, eat snacks, and play games. Last week, our main activity was singing karaoke in front of a panel of students. There were three choices: ‘Let it Go,’ ‘The Lazy Song’ by Bruno Mars, or a song by One Direction. The majority selected ‘Let it Go,’ so after two smaller groups had gone for the other songs, half of the people who came that night stood up to sing their favorite Frozen song at the top of their lungs. It was really fun, especially because some people added in little bits of choreography, and one of the judges stood up and did “interpretive dance” (meaning he just made something up). Today was my third time going; I talk with a new group every week (and the same people don’t come every week either), so I always get to hear new stories. It is always lots of fun, and I enjoy speaking in both Japanese and English with the Japanese students! Other than that, I’ve been having lots of fun with my friend Iyo, who was the first Japanese friend I made at Gaidai! One day at the beginning of the semester, I was reading at a table in the cafeteria while my friends got lunch when Iyo approached me and asked if it was ok if she sat with me. 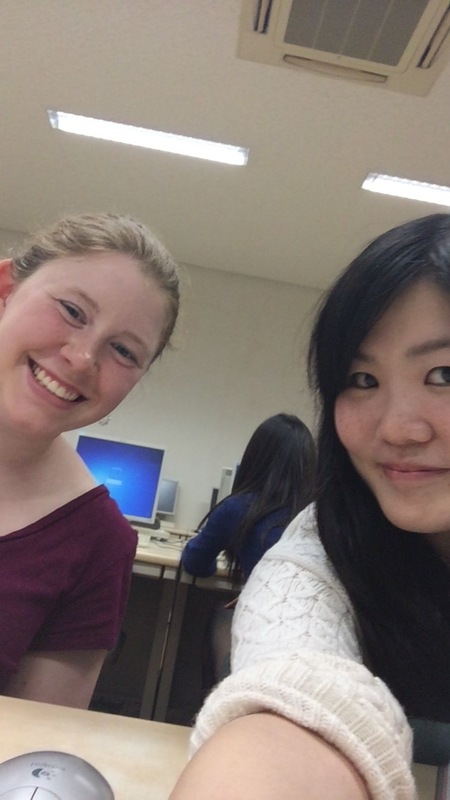 I quickly agreed; my first conversation with a Japanese person on campus!! We talked mostly in Japanese; she was impressed at my level of comprehension, and when I asked how her English was, she quickly switched, and it was my turn to be impressed. She swore her English wasn’t great, but I didn’t see anything wrong with it. It is definitely better than a lot of other students’ that I’ve talked to during the semester! 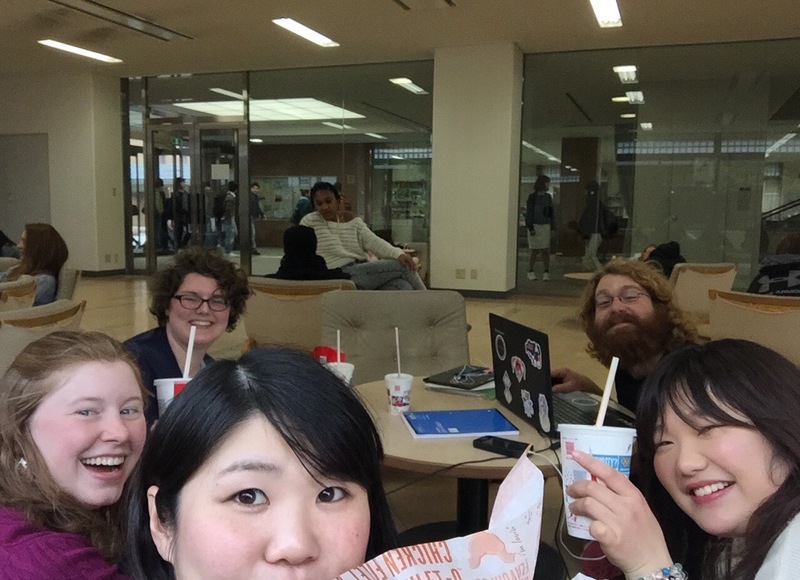 Lunch time with Iyo, Katharina, Austin, and Sango! Lately, we’ve been meeting on Thursdays to practice her English; she’s a senior and is in the midst of job hunting. Some of the jobs she’s looking at may require an interview in English, so I’ve been practicing interview scenarios with her, proofreading her English resume, and building up her confidence. In return, she has helped me a lot in my Japanese speaking skills. She was nice enough to proofread part of my ten minute long Japanese presentation, and instead of just correcting it, she highlighted what was wrong and helped me figure out the correct way to say something. Talking and learning with her has really improved my level of confidence in my speaking skills; it also helps that she’s started teaching me the local dialect, so I can better understand some of what people say around me. Next week is Golden Week, and while we don’t get the entire week off (courtesy of Gaidai), we plan to do lots of fun things together (like going to a Korean area in Osaka) since I’ll be leaving in almost a month exactly. Wow, one month! My mind is conflicted when I start to think about it; part of it can’t wait to be home and the other is desperately wishing for time to slow down. I try not to think about it too much. It’s weird to have nostalgia for a place you haven’t left yet, and it’s distracting me from filling up this time with meaningful memories. That’s all for now! I’ve already posted a new story, “Kyoto and Kimonos,” about my adventure wearing kimono in Gion! I’m hoping to also post stories for Tokyo and my recent hike up Mt. Hiei as well, so stay tuned!